Using crate training in its human and right way can bring you a lot of benefits and it cannot be compared to using a leash in any case. So there are certain benefits and you will have a chance to understand them as soon as you use crate training. First of all, you will not need to worry about your pet when you are not home. Besides, you will also leave any thoughts that something may be broken and spilled. If you are on a business trip, your attention will not be distracted and you will have a chance to concentrate on important things. At the same time, a crate will help you keep your dog close to you even if you are driving and your concentration will be directed to the road only. Moreover, some owners consider that a crate can make house breaking much easier as dogs are not supposed to spoil where they sleep. 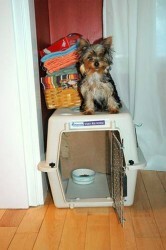 It is the best way to work out a routine of outdoor bathroom usage for your Yorkie. But, if you take a decision to use a crate, you need to buy a comfortable crate considering the size of your dog. All you need to know here is that it is better to choose a large crate rather than a small one.